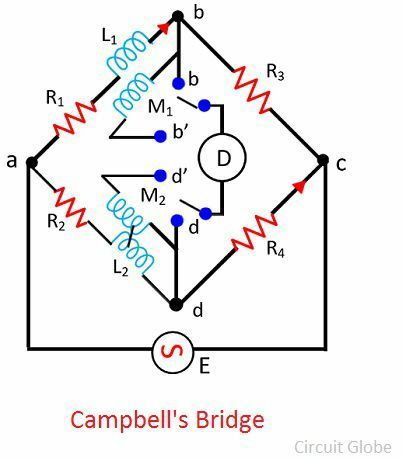 Definition: The bridge which measures the unknown mutual inductance regarding mutual inductance such type of bridge is known as the Campbell bridge. The mutual inductance is the phenomenon in which the variation of current in one coil induces the current in the nearer coil. The bridge also used for measuring the frequency by adjusting the mutual inductance until the null point is not obtained. Consider the figure below shows the mutual inductance. The two steps are required for obtaining the balanced position of the bridge. The bridge is in balanced condition by adjustment the R3 or R4 and R1 and R2. 2. The detector is connected between the b’ and d’. Along with the step-1 adjustment if the mutual inductance M2 is varied, then the balance point is obtained.